January 2014, German chancellor Angela Merkel is publicly not-amused by the news that her cell phone is being monitored by the NSA. The United States and the European countries are in a crisis of confidence. 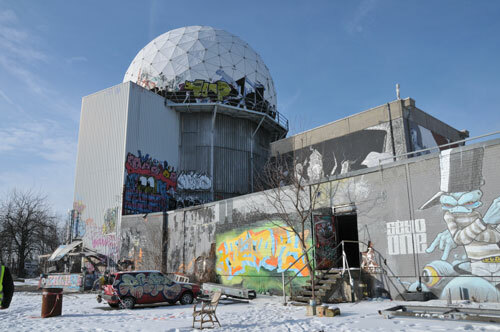 I am in Berlin, about to visit a notorious Cold War relic: the NSA “Abhörgelände” (spying station) on top of the Teufelsberg. From S-bahn stop Grunewald it’s a 20 minute walk through the forest. 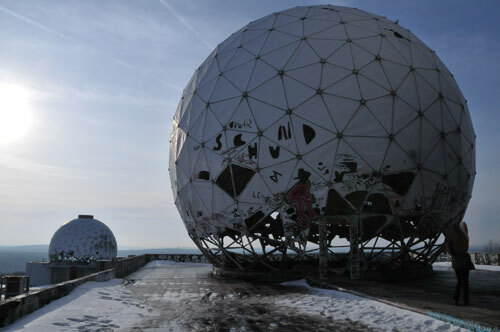 The area, distant from Berlin’s core, was already pointed out as a good site for a meteorological faculty by the nazis. Things developed differently though. In the early 1960’s, the part of Berlin occupied by the allied forces became a walled island within the DDR. Millions of tons of rubble from the war period still had to be carried out of the city. As West-Berlin was a very limited territory, the rubble was piled up in the parks. 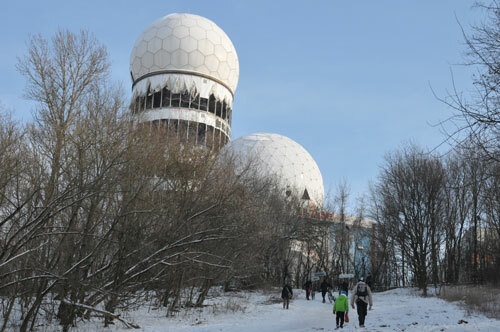 The Teufelsberg (Devil’s hill) is the highest of Berlin’s rubble hills, 120 meters high. 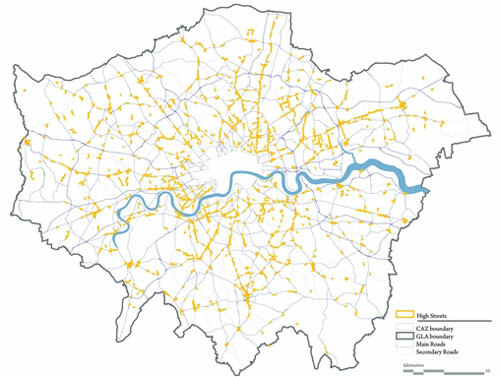 In the 1950’s the intention was to shape the hills into a ski slope (part of the area actually has this function). The Cold War, however, made the area into a tactical outpost for the Americans to spy on the Russians and the countries of the Warsaw Pact. Few years after the unification of Germany, in the early 1990’s, the complex was sold to a project developer, who wants to build a luxury residential and leisure resort. Until today, the plans have been unsuccesfull because the investments are quite high and the housing units would under the current circumstances be too expensive. In the meantime, squatters have broken in to the complex several times and have destroyed some of the buildings and facade materials. At this moment, an independent association leases the area in order to organize guided tours and grafitti festivals, while protecting the structures from further depredation. I joined one of the two-hour historic storytelling tours. In my group one guy appeared with his drone, to actually film the old NSA spying towers from above – is this the world turned upside-down or what? Besides the technical and historical information, juicy details were also supplied by the tour guide. For example, that about 7 years ago film director David Lynch tried to buy the premises to turn it into a University for Floating (a meditation technique developed by the Indian guru Yogi in the 1950’s). The plans didn’t go ahead. 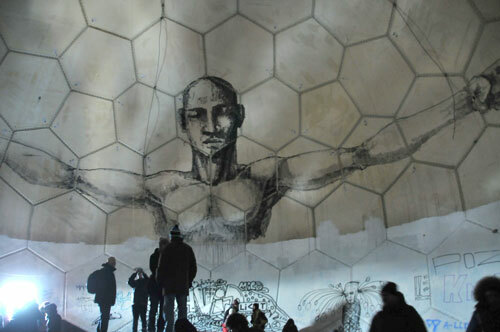 Art work inside the main dome of the spying station. Despite the clear importance to maintain the complex as a Cold War relic for future generations, the strategy of the organization doesn’t totally convince yet. They disapprove of any type of private use and investment, all use should be public (art galleries and studios for example) and all investments should hence come from the tax payers. Just straightforward Berliner activism perhaps, something we’re not used to anymore in the all too pragmatic lowlands. So for the time being things remain temporary and mysterious, also very much in the spirit of Berlin. 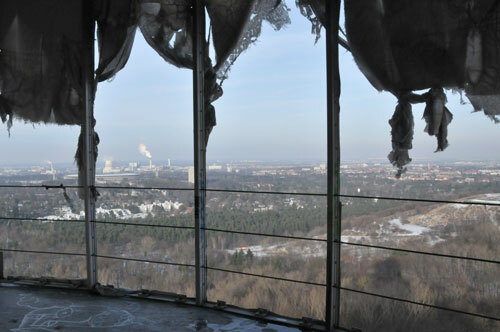 View towards Berlin through the tower facade of the spying station, ripped open by squatters. Hutong – a new model for Beijing? When China opened up and became a socialist market economy, it didn’t take long for the real estate sector to emerge and start developing the contemporary Chinese city according to the logic of capital, demand and supply. Even while many companies are still state-owned. For years, the traditional alleyway neighborhoods of central Beijing, called Hutongs, were a playing ground for profitable big scale redevelopment projects, tabula-rasa style. At some point, however, residents and critics became aware of the economic and cultural value of the small-scale homes in the Hutong, leading to long and difficult recompensation processes. During Beijing Design Week 2013 I visited the Dashilar Hutong, and later that week a few other expamples. Professor Wu Chen, also director of the Beijing Institute for Architectural Design (BIAD), presented the transformation process of Dashilar, a very central and traditional hutong, close to Tian´anmen square. Earlier that day, Jia Rong of the Dashilar Project had given us a tour. 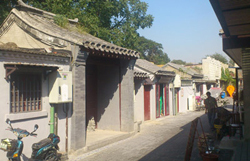 The neighborhood is to a large extent made up of one and two-storey buildings from the Ming en Qing dynasty era, with the typical structure of courtyards. The complex property situation (leases, land use rights etc. ), restrictions to building heights and costly expropriation arrangements have turned Dashilar into an area that is hard to redevelop at a profit by the (state) development companies. At the same time, developments are required, since the infrastructure, sanitation and public space in the area are precarious. Therefore BIAD has been working for years already on an alternative development strategy. 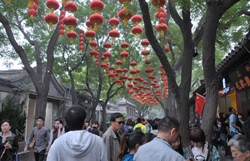 Among other measures to make people concious about the cultural value of the area, the Dashilar Phone-App was developed, through which tourists and visitors can easily explore the labyrinthic hutong and constantly receive information about design galleries, restaurants and other features in the streets of Dashilar. In collaboration with local investors, a shopping center with housing on top is being realized, avoiding the standard ‘closed box’ typology. At the same time, the infrastructure is enhanced. A new public toilet is under construction, since many of the small dwellings don’t have their own toilet. Professor Wu summarizes the project as ´Nodal development´ as opposed to the modernistic ´Tabula Rasa´ development. The permeable hutong-model with its narrow alleys was abandoned by the upcoming middle class in the 1980’s and 1990’s. The old and precarious structures – many times without a proper bathroom or connection to water and the sewage system – were easily changed for modern appartments in superblock tower buildings beyond the 3rd ringroads of Beijing. 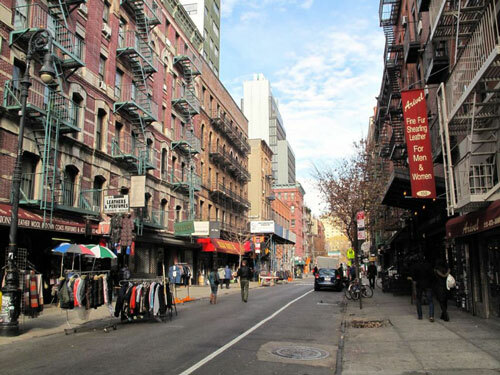 The hutong, however, is making a comeback. The new generation likes going to famous hutongs for leisure. The centrality and function mix of many hutongs have become much appreciated, since Beijing now suffers from massive traffic infarcts and monofunctional suburbanization. 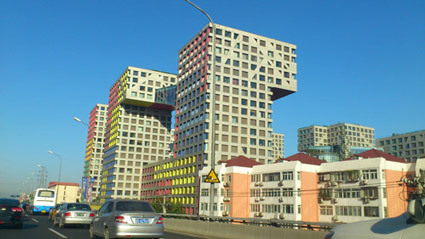 Architects like Steven Holl and Riken Yamamoto have realized housing complexes in Beijing, conceived as modern, vertical, hutongs. In their project Meta:Hutongs, architects Wang Shuo and Andrew Bryant organize workshops to explore the possiblities of the hutong model, without taking sides of either the preservationists or the demolitionists. It is one of the projects featured in the Abitare China #34, a special magazine on Hutong Adaptation. During the Beijing Design Week 2013, architecture studio Venhoeven CS organized a workshop called ‘The Sino-Dutch Approach‘, commissioned by the Creative Industry Fund. 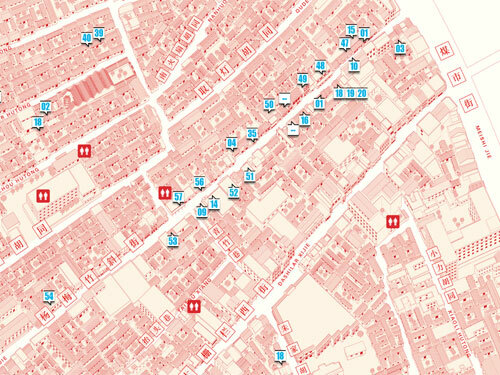 This year, Amsterdam is guest city of the BJDW. In a group of 12 Dutch designers I travelled to Beijing to work on transformation strategies for the Fengtai industrial district, in the Southwest periphery of Beijing. The aim of the workshop is to generate crossover concepts with our Chinese counterparts, for sustainable development in the capital city. 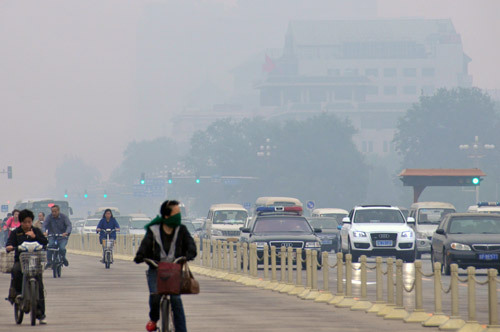 Many of China’s major challenges are found in Fengtai: air quality, water management, congestion, economic shift from production to services, migration and gentrification. 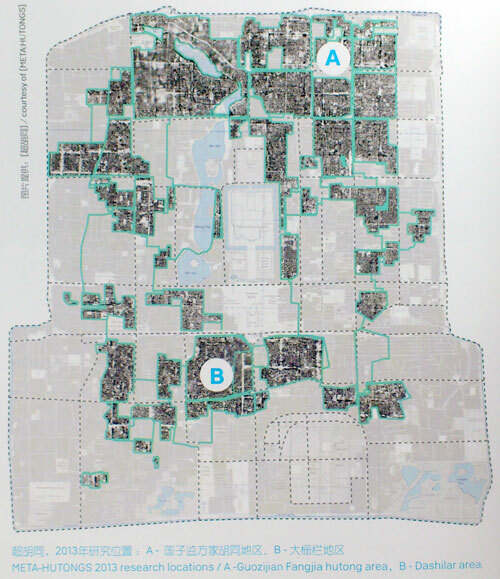 The district has the potential to become a creative subcentre and gateway to Beijing. 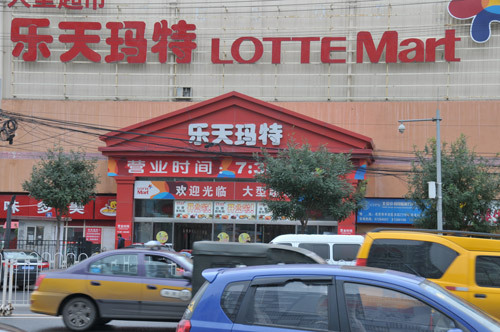 The Dahongmen area consists of fashion wholesale complexes. There are plans for fashion retail zones, focusing on the exclusive brands. The challenge here is to develop the entire value chain, from production and creation to the consumer, in order to attract and maintain a variety of professionals and social groups in the area, necessary for an innovative environment where Chinese brands and trends can emerge. 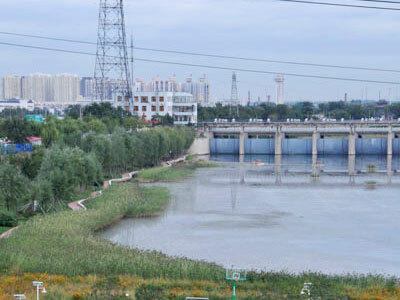 Beijing has a dramatic relationship with water. On the one hand there is so much water shortage that water is brought in from the Yangtse river in the South. The Gobi desert is approaching and the Yongding river itself is dry most time of the year due to dams and water usage upstream. On the other hand heavy rainfall has caused severe damage to the urban structures in Beijing, for lack of permeable surfaces. A new type of green living environment may revive the Yongding river floodplains and redirect rainwater to feed the river. The new high-speed railway station and subway links will strengthen the position of Fengtai as gateway of Beijing. Passengers traveling from Hong Kong and Shenzhen to Beijing will pass through the area. The station surroundings therefore have the potential to become a hotspot of activities and meetings, that may function in a complementary way to alleviate the congested central area of Beijing. Rather than redeveloping the whole area, a stepwise strategy could provide a lively area of reused industrial buildings, bike and pedestrian routes, densified ‘hutongs‘ and function mix of housing with amenities and work spaces. The main exhibition of the Design Week is about Smart Cities, held in the China Millennium Monument Museum of Digital Arts. 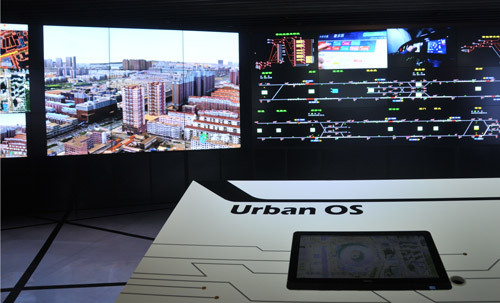 Curated by Lei Yang, it features many tools to use big data and new media to plan and enhance the city, such as Urban OS and OS City. 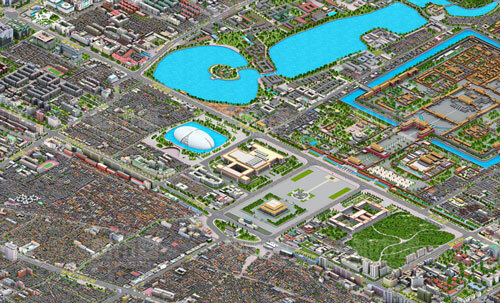 The SprintCity planning support tool may also provide opportunities for cities like Beijing. The irony is however, that at the moment the Chinese authorities do not give access to urban data and have to a large extent control over what happens at the Chinese social media. This prevents civilians from using and improving many of the smart tools. Download the presentation of the Sino-Dutch Approach, by Ton Venhoeven. Also read the daily reports by the Creative Industry Fund, and my travel journal (Dutch), including the names of all participants.